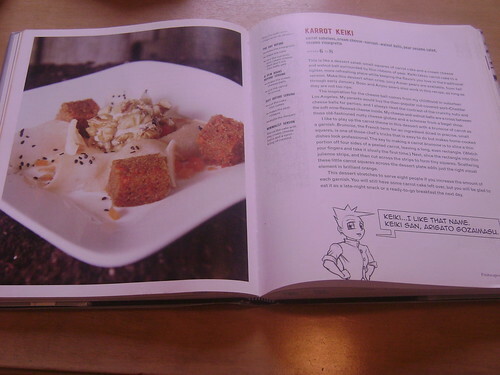 Sunday night, I’d been reading Elizabeth Falkner’s Demolition Desserts (I’ve borrowed a copy twice now from my library) before bed and saw this carrot cake: Karrot Keiki. 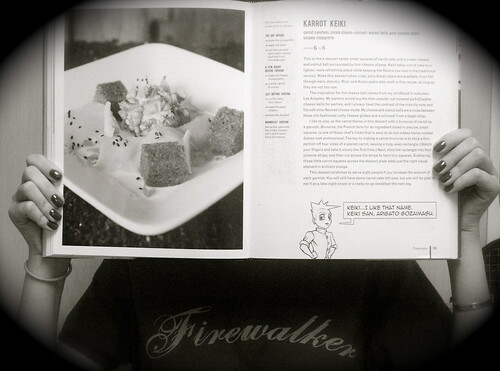 Given Elizabeth Falkner’s ways, it is carrot cake reinvented into something elegant and simple: according to the description in the book, “carrot caketons, cream cheese-currant-walnut balls, pear sesame salad, and sesame vinaigrette. Almost like a little salad, but in dessert form. I actually made two batches of these, on the same day. For the first batch I used ground walnuts (or walnut flour) in place of the wheat flour. The result tasted good (I had a few tasters, one guest ;), on site), although the consistency and texture was more like a pudding than a cake. It will be a while yet before that makes an appearance on here. The second batch, I thought, was more successful. Using brown rice flour and only a scant amount of the walnut flour just for flavour, they came out a lot better. This is the recipe that I’m featuring in this entry today. It’s the perfect carrot muffin: soft, moist, and not too sweet. Depending on what you’re in the mood for, with a little frosting, they’re turned into easy cupcakes. (Unfortunately, I ate all that was left of the frosting, so I didn’t have any to frost at least one of these for the photo shoot!) So far, I’ve just been eating them as muffins (from the second batch) and they’re great for breakfast or a snack when you’re feeling peckish. The original recipe called for baking powder (1/2 teaspoon) in addition to the baking soda, but I just used the baking soda. Although we don’t strictly follow SCD anymore, we still don’t use baking powder – for no reason except that we haven’t got back to using it. If you prefer to make a cake instead of muffins or cupcakes, Elizabeth Falkner’s recipe specifies a 4 1/2 by 8 1/2 by 2 3/4-inch loaf pan or a similarly sized 1-pound loaf pan. In her recipe, the cake is cut into cubes (“caketons”) for the presentation. I threw in a small of walnut flour to the batter in the second batch after I’d mixed all the other ingredients, which I’ve listed in the ingredients list as an estimated guess. (Maybe I’ll shoot a video soon just to show how much I throw in.) I made more – this time a double recipe -last night for breakfast this morning but forgot to add the walnut flour to the batter, so I just sprinkled small amounts of it on the tops before putting them in the oven. This way, the walnut flour can easily be mixed into the batter of each liner or can be left sprinkled on top, as I left last night’s. Preheat oven to 350ºF. 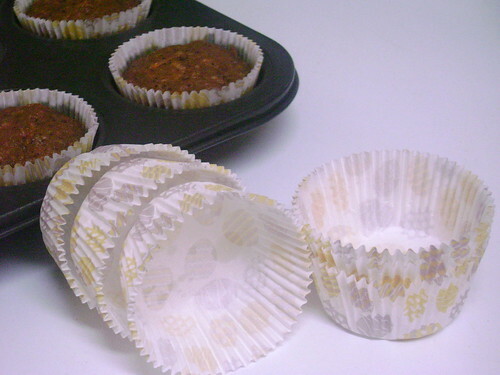 Line a standard muffin tin or a mini muffin pan with paper cupcake liners. Mix together the grapeseed oil, honey, and egg with a whisk until fully mixed. Add shredded carrot. Fold in the brown rice flour, baking soda, ground cinnamon, and salt. Mix in the walnut flour. Spoon batter into the prepared muffin tin, about halfway full, and bake for 30 minutes or until set and a toothpick or knife comes out clean from the centre. Cool in the tin briefly before removing muffins. For cupcakes, frost with your favourite frosting or Tofutti cream cheese frosting (add honey to taste and 1/2 to 1 teaspoon vanilla extract to Tofutti Better Than Cream Cheese and mix). Enjoy! 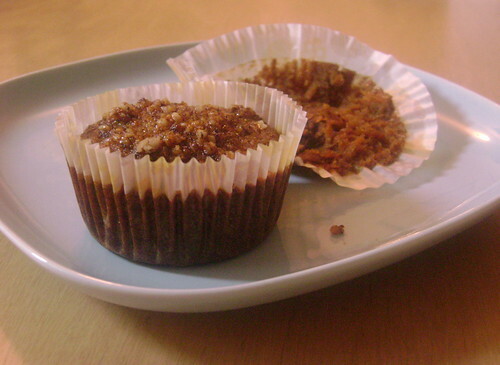 Muffins in the morning, with ground walnuts topping. 2.0 of the SCD one, which you tried! These rice flour ones hadn’t come out of the oven yet for you to try. I ate three for breakfast this morning. 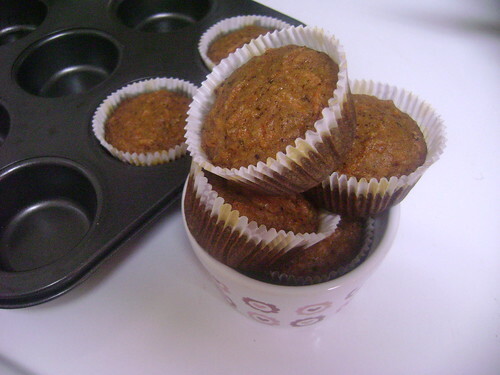 What great looking muffins, love the carrot and honey flavor combination! Thanks! They’re really good. Despite the rice flour, there’s no need for guar or xanthum gum. 🙂 They aren’t at all crumbly. 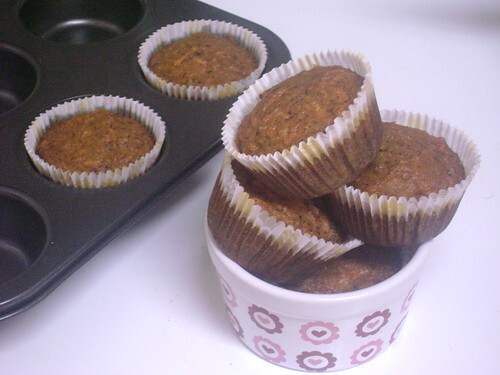 Update: these muffins still retain their moisture uncovered – even overnight! While they don’t immediately dry out, unlike other rice flour baked goods, it is best to cover them with plastic wrap or in an airtight container to prevent the paper from sticking. The slide show is working for me, and your muffins look great. Thanks for participating in Gluten-Free Wednesdays. Welcome to the gluten-free world and congratulations on your baking! I hope these turned out well for you. Your daughter is very lucky to have you.